Combining passion and the insights sharpened by decades as a respected maritime arts specialist, with solid network of relationships among leading Scrimshaw aficionados, Rafael Osona regularly uncovers absolutely stunning treasures in the field of 19th Century scrimshaw. Our Galleries have presented numerous collections of 19th C. scrimshaw and whaling artifacts including the collections of Barbara Johnson, William Coffin, Fred Gardner, Bill Dinges, William Boylhart and others. Having offered prized Frederick Myrick Susan’s teeth, a Ceres B artisan tooth, a pair of banknote engraver teeth, seagull tooth, pie crimpers, swifts, baskets, ditty boxes, private walking stick collections, busks and the likes; as well as Prisoner-of-War ship models, spinning jennies and game boxes, Rafael Osona Auctions consistently delivers the best material available to the most discerning collectors. American Patriotic Whaleman Scrimshawed and Polychrome Sperm Whale Tooth, circa 1845, the image encompasses most of the tooth with a young lady holding a chair back, wearing a laurel wreath and elaborate and elegant long dress, above an American Federal shield flanked by foliage. Whaleman Made Abalone, Whalebone and Whale Ivory Scrimshaw And Polychromed Presentation Keepsake Box, circa 1830-1850, a spectacular feat in maritime design and inlay work. The rectangular hinged box totally trimmed in whalebone, the top has an ivory scrimshawed plaque engraved with a spread winged eagle clutching arrows and laurel with banner in beak and budding vine border, sawtooth and star frame. Mother-of-pearl quarter-fans at the corners, diamonds and 8 various designed pinwheels and more. The front and sides have a 2-tier mother of pearl inlaid curtain swag and drop border with dots and stars above a sunburst center flanked by robust cornucopias. Each side with whale ivory posts and ring handles flanked by stars and teardrop wheels. All with saw-tooth base trim supported on four whale ivory turned feet. The reverse inlaid with mother of pearl dots, teardrops and diamonds, 6-point star flanked by 2 American shields with 4-polychromed flags – American, British and others. The underneath pine box trimmed in whalebone straps. Height 6 in. Width 11 ½ in. Depth 7 ¾ in. Large Whaleman Scrimshawed Polychrome Busk, circa 1850, the triple arched crest with a willow tree above two American flags and shield with a ring of stars within a curtain swag; the next section depicts a flowering urn on a pedestal above a fine 3 ½ story building with steeples and clock tower with weather-vane, flanked by flowering branches; the bottom section with chevron design above an 8-point star. Exceptional and Fine Carved Whale Ivory Pie Crimper, circa 1850-1860, the large crimper in three sections, all from the same sperm whale tooth. The solid zigzag wheel pinned to a pierced and hollowed grip and silver pinned large stylized feather finial with scroll-work and geometric design throughout. Large Whale Ivory and Whalebone Walking Stick, circa 1850, a well defined ivory fist grip and collar clenching a scrimshawed serpent twice through the palm and around the wrist. The collar and ivory section divided by two copper spacers, one carved with a series of octagonal disks, reeding and cross-hatching; the tapering shaft with fine and deep hatch-work above a rounded ring above a rope carving with worm-line, ending in a 4 ¼” ferrule capped in pewter. Very Fine Architectural Whale Ivory and Whalebone Inlaid Walking Stick, circa 1855, the smooth ball grip inlaid with an abalone dot, the lower section reeded, both halves are separated by an octagonal wafer, all carved of a single piece of ivory; the bone shaft starts with a small octagonal section with tortoiseshell diamonds and mother of pearl panels above an architectural section with four reeded columns with a unique addition of a baleen rope carved interior post and cathedral-like open windows on all four sides as capitals inlaid with silver squares; the next section having 56 tortoiseshell, baleen & abalone inlays on carved octagonal panels with reeding. The lower section is a tapering and reeded to a ring then a smooth tapering end. Whale Ivory, Whalebone and Silver Swift, mid 19th century, the very large turned ivory cup finial, table clamp and cage studded with silver and initials E.T.B, whalebone shaft and 13 ½ inch ribs supported by a fine left clenched fist clamp; accompanied by a fitted box of dovetailed construction with turned and wax filled scribed line feet, side and top knobs, four wood inlaid hearts, twelve diamonds, four ¼-inch rounds and a five-point star. Swift Height 21 ½ in. Box Height 6 in. Length 22 ½ in. Width 4 ½ in. Provenance: Sold Rafael Osona Auctions as part of the William Coffin Collection, 2004. Whaleman Made 3-Wheel Whale Ivory Pie Crimper, circa 1850, a thick ivory stylized leaf-form grip inlaid with mother-of-pearl and abalone flower on both sides; the mid-section divided by square baleen spacers with two small solid zigzag wheels, the upper yoke section holds a solid zigzag wheel. Whaleman Made Scrimshaw Chambered Nautilus Display Case Stand, circa 1850, in two parts, fashioned of dovetailed ebony and inlaid with ivory and mother of pearl dot and diamond borders, 6 three-section ivory columns with carved capitals, baleen spacers, 7 very fine turned finials, the upper two-tier section with rare shell specimens above a 6 column display of a two mirrored halves of the chambered nautilus shell, a unique feature of the piece is the side pull out inlayed framed protection glass to expose the nautilus shells. Height 16 in. Width 15 in. Depth 4 ½ in. Whaleman Made Watch Tower, circa 1850, the hold and face plate of whalebone surmounted with an ivory dome with tortoise inlays and silver stars and three removable scrolled spikes, flanked by a full pair of antique sperm whale teeth with a silver stave and tortoise inlaid base step, all on a cut corner rectangular tortoise shell base with silver plaques. The edge of whalebone and inlaid tortoise plaques on ivory ball feet. Height 8 in. Width 8 ⅞ in. Depth 4 in. Note: A watch tower by the same hand is illustrated page 213 of E. Norman Flayderman’s Scrimshaw and Scrimshander, Whales and Whalemen. Whale Ivory and Leather Walking Stick, circa 1870, well defined and carved clenched fist holding a rod above a spool, reeded twist and rings on a tapering leather shaft and brass ferrule. Whaleman Carved Ivory and Whalebone Walking Stick, circa 1850, ivory domed and paneled knob grip with silver dot inlays and scribe lines, whalebone paneled and scribed section above deeply reeded and tapering shaft ending in a 4 ¼ in. ferrule. Whaleman Carved Whale Ivory and Malacca Wood Walking Stick, circa 1870, ivory knob grip above a carved bas relief perched eagle on a stars and stripes shield, foliate engraved gold filled band on a tapering Malacca shaft ending in a 2 ½ inch horn ferrule. Whaleman Carved Whale Ivory and Whalebone Cane, circa 1870, ivory carved and scrimshaw grip of an eagle head and neck on a whalebone shaft carved with rope twist tapering to a reverse twist. Whaleman Carved Whale Ivory and Whalebone Lady’s Walking Stick, circa 1850, the upper third comprised of four carved ivory sections, the grip a Turk’s turban above a crosshatched section, above a section of five openwork twisted columns above a twist section, all spaced with blonde baleen rings with silver diamond, the bone shaft reeded and twisted rope to a smooth, ending in a 2 inch ivory ferrule with ball tip. Fine Whaleman Carved Whale Ivory, Whalebone, Mother-of-Pearl, Abalone, Tortoiseshell and Baleen Walking Stick, circa 1840, polyhedron ivory grip with tortoiseshell inlaid squares, dots, circles and heart, three baleen spacers on a well inlaid bone shaft of geometric shapes, dots, lattice and swags, ending in a graduating turned taper. Whaleman Carved Walrus Ivory and Abalone Competition Seven-Wheel Pie Crimper, circa 1870, the handle inlaid with abalone diamonds and dots on each side with sawtooth carved edge and applied fork, one end with two zigzag wheels: one small solid and one with open heart spokes riveted to stylized bird yokes; the opposite side with four small zigzag wheels and crosshatch carved yokes and a larger open heart spoke zigzag wheel. Length 8 ¼ in. Whaleman Carved and Pierced Whalebone Knitting Basket, circa 1860, oval form comprised of 28 pierced and shaped staves flaring out and up supported by half-round upper band and lower scalloped band, tacked to a conforming pine bottom. Height 4 ¾ in. Length 9 ½ in. Width 7 ½ in. Note: G. H. Kempton is recorded as Master of the ship Orphan, sailing between New York and Le Havre, France (1856) and of the bark Clyde, between New York and Mobile Alabama (1851). Source: Carl Cutler, The Story of America’s Mail and Passenger Sailing Lines, Annapolis, MD, US Naval Institute, 1961. Whaleman Carved Whale Ivory and Whalebone Pointer, 19th century, the tapering whalebone shaft with spiraling worm-line carving, baleen spacers, ivory tip and ring-collared whale ivory bulbous grip. Fine Whaleman Carved Whale Ivory and Wood Clenched Fist with Serpent Walking Stick, circa 1860, right hand grasping the head of a serpent as it is coiled twice around the wrist with a petal shirt cuff, ebony and ivory spacers on a wood shaft, the upper section paneled with ivory and ebony panels and four ivory dots and four tortoiseshell diamonds, the lower section turned and tapering to a two inch ivory ferrule. Whaleman Carved Whale Ivory, Whalebone and Rosewood Walking Stick, circa 1860, large paneled and carved ivory grip with baleen spacers, the upper section of the shaft comprised of 13 graduating and contrasting octagonal sections of ivory and rosewood, the lower section of turned and tapering whalebone. Fantastic Large Size Polychrome, Stippled and Scrimshawed Sperm Whale Tooth, circa 1840-1860, a portside view portrait of an American bark in full sail flying colors and pennant, a mermaid with headdress, long flowing hair holding an arrow tied to a banner “Let Sailors Be Obedient When Men of Worth Command”; the reverse vertical scene of an “Inn” with twin chimneys and picket fence above an iron arbor surrounded by leaf stalks with kissing birds above the word “Love”; the tips with four decorative wraparound borders and the base with two decorative wraparound borders. This skillful engraver with his design and execution was able to minimize the slight deformity of the tooth. Fine Polychrome Scrimshaw Sperm Whale Tooth by William Sizer (American 1801-1840), circa 1835, a three-quarter portrait of a well-dressed fashionable lady, within an oval sawtooth cameo and leaf-line secondary border; mounted on a cut and shaped silver base. Sizer was born in Chester, Massachusetts and was the grandson of a Revolutionary War captain of Franco-Azorean descent from Middletown, Connecticut. More than a dozen known teeth are attributed to Sizer. He was a crew-member of the brig Juno (1839-1840) out of New Bedford, he died at sea in 1840 and is buried in Tahiti. Reference: Frank, Stuart M., Ingenious Contrivances, Curiously Carved, published 2012, pg. 25. Large Scrimshaw Sperm Whale Tooth by the Locket Engraver, circa 1840, a young girl with long curls and deep dark eyes intensely focused on her cameo necklace, the reverse depicts an off the starboard stern view of the Constitution, flying colors on the open seas with “Constitution” in script under the choppy water. Length 6 ½ in. The Locket Artisan is an anonymous hand, active in the early 1840s. Fine lines and dark pigments characterize his work. Reference: Frank, Stuart M., Ingenious Contrivances, Curiously Carved, published 2012, pg. 89. Early Fine Scrimshaw Lower Panbone Pictorial Plaque, circa 1830, whaleman executed, depicting a three-tier American gun ship anchored off a headland with fortress, an unexecuted information plaque on the upper left (a place for the recipient, giver, port-of-call, ship, etc. ), lower vignette of two American barks portside views in full sail, all encompassed in diamond and arc borders; strong ink contrast. 7 ¼ in. x 7 ½ in. Literature: Flayderman, E. Norman, Scrimshaw and Scrimshanders – Whales and Whalemen, New Milford, Connecticut, Published 1972, pp. 217. Fine Nantucket Whaleman Made Whale Ivory and Whalebone Swift, circa 1860, the ivory finial cup, standard, support clamp and base scribed and polychromed in red, green and black. Supported on a large finely rendered clenched fist table clamp with an abalone diamond inlay. The single 8 inch whalebone cage extending from a whale ivory support sliding on a partial whale ivory and whalebone shaft. Whaleman Carved Whale Ivory and Whalebone Walking Stick, circa 1850, carved ivory clenched fist with scrimshawed shirt line, three tropical wood and two ivory spacers on a tapering worm-line rope whalebone shaft, ending in a metal ferrule. Whaleman Carved All Whalebone Walking Stick, circa 1850, octagonal carved knob grip on a conforming band and section, metal collar above five scribe rings, with a rope twisted section flanked by two thirteen-paneled rings and wafers, over an octagonal shaft tapering to smooth, ending in a metal ferrule. Rare Whaleman Carved and Painted Whale Ivory and Whalebone Walking Stick, circa 1850, carved whale ivory spotted serpent coiling downward on itself, on a barber pole painted tapering whalebone shaft, ending in a copper ferrule. Extraordinary Whaleman Carved Whale Ivory and Whalebone Walking Stick, circa 1840, finely carved ivory hand grasping a stippled snake about to strike with cut copper fangs, leather eyes, red polychrome mouth wrapped around the wrist and forearm, baleen spacer, on an octagonal paneled tapering to smooth whalebone shaft. Fine Pair of Scrimshaw Whale’s Teeth, 3rd quarter of the 19th century, engraved and inked with images evoking a narrative of joy and sadness commingled, a handsome young couple on their wedding day, an open bible, a mother and child and an urn flanked by weeping cherubs beneath a willow. Nantucket Whalebone, Whale Ivory and Wood Swift, circa 1850, from the famed Carpenter collection; multi-turned upper section with red scribe wax lines on a whalebone shaft and a matching turned ivory adjustment slide and knob, on a two-tiered shaped round ebony and mahogany base, supported by 12 turned ivory posts and feet, the central shaft protruding through both wood disks and secured by a hand carved whalebone thumb twist nut. The cage is constructed of 144 whalebone ribs. Height 22 ¾ in. Diamter of base 7 in. Whale Ivory and Whalebone Clenched Fist Walking Stick, circa 1850, the top ⅓ of the stick carved in four sections of whale ivory, the grip of a right hand clench fist with incised fingernails and buttoned shirt cuff, elongated diamond section above very finely carved cross hatching, above a zigzag reeded section. All the sections defined by octagonal baleen spacers within faceted band and thin rings, the lower portion of the tapering whalebone shaft carved with a triple line coiled around an octagonal section above a finely carved rope section above a round tapering section. American Wood and Scrimshaw Whalebone Cutlery Box With Drawer, circa 1870, the central divider with three finger rolls flanked by hearts, the tray box decorated with scrimshawed whalebone inserted edge panels and side case arrows, the whalebone scrimshawed and cockbeaded drawer with turned whale ivory knob. Height 6 ½ in. Length 13 ½ in. Depth 7 ¾ in. Whale Ivory and Whalebone Figural Walking Stick, circa 1870, carved ivory sailor grip, with hat, long hair, sideburns, in shoe dress, leaning on a tree stump holding his pipe, on a round tapering whalebone and ivory shaft with four baleen spacers. 19th Century Whalebone, Whale Ivory, Baleen and Silver Cane, circa 1860-1880, ivory carved eagle head with silver and baleen eyes, baleen spacer with ivory C-shaped grip on a tapering whalebone shaft. Length 34 ½ in. 19th Century Whalebone, Whale Ivory and South Sea Island Wood Serpent Walking Stick, circa 1850, the whale ivory grip is in the form of a looped serpent with inlaid ebony eyes, seven alternating spacers of South Sea island wood and whale ivory followed by a tapered whalebone shaft. Length 33 ¾ in. 19th Century Whalebone Whale Ivory and Baleen Snake Cane, circa 1860, an ivory serpentine L-shaped snake grip above an ivory section flanked by baleen spacers, on a turned whalebone shaft. Length 33 ¼ in. of The Ship “Elizabeth of London,” deeply carved, engraved and inked with red polychrome highlights, the obverse depicts a very active whaling scene with seven whales, one with attached waif, manned whaleboats and a capsized whaleboat. Inscribed beneath in scrip “Elizabeth of London”; the reverse with the same starboard broadside view of a full-rigged ship underway, under plain sail flying a British merchant ensign and “cutting-in” a sperm whale. The tip with foliate wreaths, the base with double lines and dots. Length 6 in. Width at Base 2 in. An exceedingly rare and historically important Nantucket scrimshaw sperm whale tooth signed in cursive at the cut edge “Made.By.Edward.Burdett”. The obverse engraved with a starboard view of the “Pacific” under sail; the reverse with a port view of the “Pacific” under reduced sail and cutting in a blanket of blubber with a whale alongside, which is a rarer occurrence on the port side; the top edge with a foliate border and “Pacific of Nantucket” engraved on the lower edge in cursive between the scenes, a leaf vine border surrounds the base. Length 4 ¾ in. Width at base 2 ¾ in. Edward Burdett the earliest known American whaleman artisan was born on Nantucket in 1805. The legendary “islander” joined the historic Nantucket whaling industry and his work’s date from the mid-1820s to 1833, he died at sea in 1833. This “Pacific of Nantucket” tooth is the only known example of Edward Burdett’s work to have descended in the family. It was likely a gift from Burdett to his sister Nancy Burdett Davis. 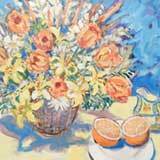 Provenance: From the artist’s sister, Nancy Burdett Davis (b. 1808) to her daughter Sarah B. Cordiss (b. 1830) directly descended in the family to a private collector. Sold again in 2013 to the current private collector. Literature: Refer to Stuart M. Frank & Joshua Basseches 1991 monograph “Edward Burdett, 1805-1833 America’s First Master Scrimshaw Artist” for further details on this whaleman artist. Exhibited: Nantucket Whaling Museum, Scrimshaw Gallery June-July 2005, commemorating the opening of the newly renovated museum. Height 2 ¼ in. Length 6 ½ in Width 4 ¾ in. A similar basket by the same hand and similar size sold at Rafael Osona’s Auctions on August 1, 2009, lot 98. Sailor Made Scrimshaw Panbone Oval Inlaid Ditty Box, circa 1830, the lid inlaid with rosewood star within an ivory and wood wreath and wrapped in panbone, the base wrapped with a single piece of panbone and joined with 3 finger laps. Height 3 in. Length 8 ¼ in. Width 6 in. 19th C. American Sailor Scrimshaw Panbone Section Plaque, circa 1840, a two-tier pictorial of two fully rigged ships on the open sea above a large portrait of a similar merchant ship approaching l and within a faint double line border. mounted in a custom reeded frame with gilt stars in each corner. 6 in. x 7 ½ in. 19th C. American Sailor Scrimshaw Whale Tooth, circa 1840, engraved throughout with an American fully rigged ship above the seal of the United States and an eagle holding a “Liberty ~ Constitution” banner in its beak, above a gentleman’s portrait flanked by cornucopias and American flags; the verso with a single leaf flower above a whaler cutting in and two whalers, whale and two whaleboats on the water. Sawtooth borders at the base of the tooth; Between the scenes is a sailing ship with her stunsail set sailing toward the viewer above a spouting sperm whale, the outer tooth’s edge with a foliate vine. Sailor Carved Whale Ivory Fist Walking Stick, 19th century, a massive detailed carved fist atop a hardwood shaft inlaid with alternating whale ivory and baleen triangles at the collar, and two abalone dot inlays below. Sailor Carved Whale Ivory and Whalebone Architectural Walking Stick, mid 19th century, octagonal shaped grip with red sealing wax circular inlay at the top, the shaft carved of a single piece of whalebone. Sailor Scrimshaw Whalebone Corset Busk, mid 19th Century, inscribed and inked in black with geometric motifs and jardinière issuing blossoming vine centering script initials “B.K.W.” Length 14 ½ in. Ivory Pie Crimper Handle of Dove Form, 19th century, elegantly stylized emblem of love, with brass rivets, lacks jagging wheel. Carved and Turned Whalebone and Satinwood Clock Stand, 19th century, rectangular with scalloped apron on turned legs. Height 3 in. Length 14 ¼ in. Width 7 ¼ in. Extremely Rare and Fine “Map Tooth” Sailor Scrimshaw Whale Tooth, American, mid 19th century, delicately incised in exquisite detail with map and chart of New Bedford Harbor, Buzzards Bay and the Elizabeth Islands, depicted center is a whaling ship’s return to port, showing its plotted course verso with an action filled whaling scene, a ship and four boats (one stove) hunt amidst a pod of whales spewing red-inked blood. Literature: Illustrated p. 2 and 60 of : E. Norman Flayderman, Scrimshaw and Scrimshanders, New Milford, CT, 1972. Scrimshaw Decorated Mahogany and Mother-of-Pearl Parquetry Box, 19th century, rectangular with hinged top, inlaid with baleen, whalebone and abalone motifs and stringing overall, the front centered by a scrimshanded whale ivory plaquette engraved and inked in red and black with “Triumph of Love”. Height 4 ¾ in. Length 12 in. Width 8 ¼ in. Rare Nantucket Whale Ivory and Whalebone Swift, mid 19th century, ribbon tied ivory staves on turned ivory standard with cup finial, whalebone shaft and ivory clamp with two screw peg fasteners, mounted to a modern rosewood stand. Overall Height 12 in. Diameter of Base 5 in. Walrus Ivory Pie Crimper, 19th century, with tortoiseshell inlaid handle, three-tine fork and five baleen spacers. Whale Ivory Pie Crimper, 19th century, fluted shaft, stepped square wheel mount and terminal with abalone inlaid dot, delicate wheel. Length 6 in. Architectural Whale Ivory Pie Crimper, 19th century, polyhedron terminal with abalone inlay and pivoting ring handle. Whale Ivory Pie Crimper, 19th century, crown terminal, half round handle pierced with two hearts and a lozenge. Fist and Cuff Whale Ivory and Rosewood Cane, 19th century, carved ivory finial, baleen separator, octagonal tapering upper shaft with alternate ivory and rosewood sections, transitioning into a circular rosewood lower shaft, with ivory tip. Grasping Hand Whale Ivory and Whalebone Cane, 19th century, rivet fastened knob carved as a right hand gripping a baton detailed with a five pointed and six pointed star at opposite ends, tapered octagonal upper shaft with three baleen separators and a plaited baleen collar, whalebone shaft tapers to round, lacks metal tip. Inuit Carved Walrus Ivory Shaman Chain, Northwest Alaska, mid to late 19th century, comprising 32 links, the first carved to resemble a whale’s head and the last a tail, all carved from a single walrus tusk, on contemporary stand. Note: Chains like this were used as charms by native Alaskan whalers and were often seen attached to baleen cups made to give whales their first drink of water after being caught, a common ritual practice in the coastal Alaskan areas which relied heavily on whaling. Pair of Mid-19th Century “Banknote Engraver” Scrimshaw Sperm Whale Teeth, incised and inked recto with framed oval reserves of lovely young women, verso with harbor scenes, one depicting two three-masted ships anchored before a town, the other shows an American ship entering a foreign port, the national flags inked in blue and red. “Banknote Engraver” Scrimshaw Whale Tooth, circa 1840, large broad tooth, recto with a portrait of a pensive lady seated at a table with an open book wearing a formal dress with puffed sleeves, curly hair and a pair of bracelets, within an elaborate oval geometric frame, an engraved foliate garland encircles the tooth’s tip, a geometric and foliate engraving encircles the base, verso with a simple floral bouquet. 19th Century Sailor Scrimshaw Polychrome Sperm Whale Tooth, circa 1830-1850, French war ship with cannons at the lighthouse, the verso with sailor pointing and holding a saber by an American Flag standing on a castellated rampart. Sailor’s Folk Art Toy Whalebone Mounted Wheelbarrow, mid 19th century, shaped oak box on frame with carved whalebone braces, cleats, and ferrules, iron bound wheel with mahogany spokes inserting into turned whalebone hub, brass axles held by whalebone sockets. Height 9 ¼ in. Length 31 in. Width 14 ½ in. 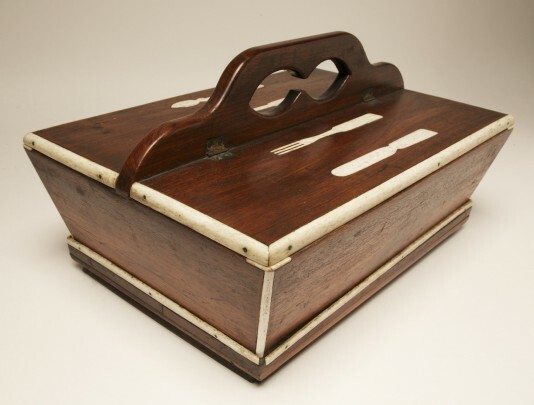 Whalebone Inlaid Rosewood Cutlery Box, 19th century, of rectangular form with carrying handle flanked by two hinged covers, inlaid with eating utensils and opening over a tapered case. Height 17 ¾ in. Length 15 in. Width 10 ¼ in. 19th Century Whale Ivory and Whalebone Swift, turned and scribed cup, pan and ring above a single bone cage on a bone shaft. The clenched fist clamp carved from a single whale’s tooth, the support ring and screw knob with red scribe lines. Overall Length 17 in. Length of Staves 10 in. 19th Century Nantucket Whale Ivory and Whalebone Swift, turned spire top cup finial above a single bone cage with ivory and bone shaft supported on a multi-turned and polychromed ivory section and clamp. Overall Length 20 ¾ in. Length of Staves 8 ¼ in. 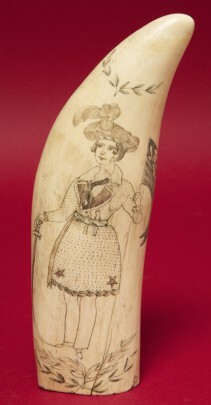 Scrimshaw Sperm Whale Tooth Depicting “Fanny Campbell The Female Pirate Captain“, American, 19th century, Engraved and inked in polychrome, the celebrated corsair is portrayed in plumed hat, waisted coat over pantaloons, two pistols in her belt, a cutlass in her right hand and a skull & crossbones flag in her left, the verso depicts an American frigate, all further embellished with leafy branches above and below. Note: The image of Fanny Campbell is based on the cover illustration of the book of the same name, published Boston, 1845, a boxed copy of “Fanny Campbell, The Female Pirate Captain” accompanies this lot. Sailor Made Whale Ivory and Baleen “Garden of Eden” Pie Crimper, 19th century, serpent handle, star centered zigzag jagging wheel, and with the unusual addition of a pastry template intaglio carved with head on leafy stem (recto) and tulip (verso). Length 7 ½ in. Width 4 ½ in. Note: Apparently carved from a single tooth, though interrupted by separators. Sailor Scrimshaw Sperm Whale Tooth, 19th century, recto stipple engraved with a fashionable beauty beside a fountain of classical inspiration, attended by a flying dove, all below a blossoming rose, verso with an American frigate, a Federal eagle above, on a wood stand. Sailor Scrimshaw Polychrome and Rivet Decorated Whalebone Busk, American, 19th century, engraved with a Federal eagle spread winged above initials “A. H.”, a frigate and the Boston State House, within copper rivet border and heart and star motifs, respectively, at the ends. Length 12 ½ in. Width 2 ¼ in. Pair of Sailor Scrimshaw Polychrome Sperm Whale Teeth, 19th century, each engraved recto with a large bird atop a tree stump, amidst luxuriant leafy branches, her companion flies overhead, verso swan swims on placid water, flanked by overreaching slender trees, mounted together on a rectangular wood plinth. Length 6 ¼ in. and 6 ½ in. Sailor Made Walrus Ivory Pie Crimper, 19th century, pierce carved handle with red wax stringing, two-tine fork, Greek key edged wheel centered by a mariner’s star. Pair of Sailor Scrimshaw Polychrome Sperm Whale Teeth, 19th century, engraved with a French and a British frigate, respectively, each beneath a crescent moon and three mariner’s stars, on rosewood stands. Length 4 ½ in. and 4 ¼ in. Exceedingly Rare and Sophisticated Polychrome Scrimshaw Walrus Ivory and Baleen Busk, mid 19th century, finely executed by a highly skilled artisan, the double arched top scribed with amatory motifs (torch, bow and arrows, billing doves) and conjoined hearts inlay of baleen above four engraved pictorial registers depicting a British warship between two fashionable beauties and flower filled urn, engraved overall with stylized floral garlands. The baleen verso engraved with five registers, viz., a fashionable beauty centering depictions of warships and flower filled urns. Length 14 ½ in. Width 1 ¾ in. Nantucket Caldwell Family Whalebone and Whale Ivory Swift, mid 19th century, turned and scribed steeple top carved of a single tooth above a ruffle, tortoise diamond collar, multi-piece ivory shaft with baleen and tortoiseshell inlays, two further tortoiseshell diamond collars, an unusual whale ivory clamp of double stylized fluke form with tortoiseshell inlay and polyhedron screw, and terminating in a turned grip. 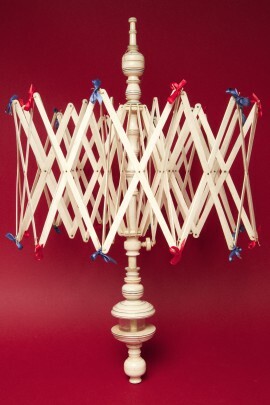 The double whalebone cage with multi-color silk ribbon ties, copper rivets and with parallel scribe lines. Overall Length 25 in. Length of Staves 10 in. Fancy Sailor Made Inlaid and Polychromed Double Scrimshaw Swift, circa 1850, known as the Baroque swift, one of 3 by this hand to date. The 2nd in a private collection and the 3rd at the New Bedford Whaling Museum and illustrated on page 278-279 in Stuart Frank’s “Ingenious Contrivances, Curiously Carved Scrimshaw in the New Bedford Whaling Museum”. Among the three, this swift is the only one with dot inlaid ribs. The top turned finial unscrews to accommodate a wood ball to rest on the cup, whale ivory clasp, cup finial. Original green stained fitted box. pine top and bottom, both wrapped in panbone, the box with 2 long gooseneck laps. Wraparound polychrome engraving of a budding floral vine. Height 2 ¾ in. x 5 ¼ in. x 4 in. Honduras mahogany top inlaid with an ivory oval surrounded by 2 bands of baleen and ivory diamonds and wrapped in panbone with 2 circular laps. The box wrapped in a single piece of panbone joined by 4 lollipops, spikes and cut out circles with copper rivets. Height 2 ¾ in. x 7 in. x 5 ¼ in. the lid with inlaid rosewood star within an ivory and wood wreath and wrapped in panbone, the base wrapped with a single piece of panbone and joined with 3 finger laps. Height 3 in. x 8 ¼ in. x 6 in. multiwood wood star and diamond inlaid top with two finger laps ending in lollipop ends, the box with pine base and 5 finger laps. Height 2 ½ in. x 7 in. x 5 ¼ in. the wood cover inlaid with 66 pieces of mother of pearl, ivory, 5 types of tropical woods and wrapped with panbone. The box wrapped with a single piece of panbone joined by 5 scalloped laps. Height 4 in. x 8 in. x 6 in. oval form with tropical woods inlaid top with conforming engraved panbone band of squares within line borders. The engraved panbone body depicts a brig under sail, expansive cathedral, Greek style structure with trees and a church. Height 5 ½ in. x 9 ½ in. x 7 ¼ in. pine bottom wrapped with a single piece of panbone, carved with two rows of interlocking circles and a scalloped rim and a stationary handle. Height 3 in. x 6 ¾ in. x 5 ¼ in. Height 2 ½ in. x 8 in. x 5 ¼ in. Sailor Made Nantucket Pierced Panbone Oval Covered Box, circa 1840, mahogany top with an interlocking circle panbone band on a conforming box of a single piece of bone having arches, diamonds, triangles, half rounds, spikes and interlocking circles. Note: the base was never riveted to the box as is with all the other baskets and boxes of this style. The elaborate carved rim, which is concealed when covered, leads us to believe this was designed for multi-purpose use, a fine example of 19th C. Scrimshaw. Height 4 ½ in. x 10 ¼ in. x 7 in. Height 2 ¼ in. x 6 ½ in x 4 ¾ in. pine wood bottom wrapped with a single piece of panbone, cut with interlocking circles and dots and swing handle attached by rivet, a fine example 19th C. Scrimshaw. Height 4 in. x 10 ¼ in. x 6 ½ in. Engraved with town scenes, sailor and wife, dog, stars and ships. Length 14 in. Provenance: William Boylhart Collection. SOLD FOR $71,920.00 August 6, 2011. A carved Ivory Fist Clenching a snake coiled about the hand and wrist, with inlaid eyes and extended forked tongue; above carved and chamfered tortoise shell inlaid long panels, the octagonal whalebone shaft inlaid about half way down with abalone, mother of pearl, tortoise shell and wax with seven baleen spacers. A Captain’s walking stick by the same hand, from the Barbara Johnson Collection, sold in the Osona Auction Room, August 13, 1994 Lot #147, setting a world record at the time of $49,000. Planked and pinned hull, 16 brass guns, horse hair and textile rigging, planked bone base with lattice gallery. Model: Height 10 in. Length 11 in. Width 4 in. Case: Height 12 in. Length 15 ½ in. Width 8 in. A small model of a 78 gun ship-of-the-line, planked and pinned hull with baleen wales, bone gun carriages, polychrome and finely carved stern on a carved wood base with bone turned parts and nails and glass dome case. Model Height 10 in. Length 11 in. Depth 3 ½ in. Delicate turned ivory cup above a large single whalebone cage with an animal head open mouth clamp and carved reclining dog on back side and fine clenched fist nut. Height 17 in. Provenance: Descended in the Swain Family to the Present Owner. 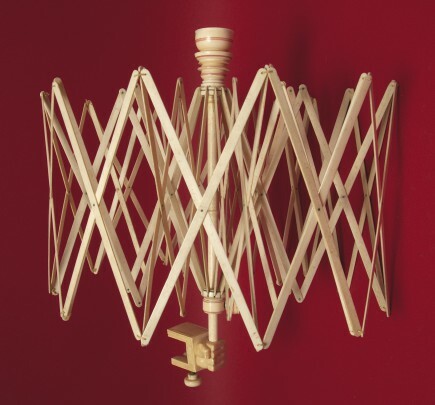 Tiger wood shaft supports a simple single bone reeded cage. The cup inlaid with silver dots delicately turned throughout with tortoise rings. The barrel form clamp of turned ivory inlaid with a sawtooth border of tortoise, dot inlays of silver and abalone with blank nameplate. Height 17 ½ in. Provenance: Descended in the Swain Family to Present Owner. Carved and turned ivory cup, fittings and base, with bone shaft and 160 reeded staves and the outer cage with additional dot and line piercing at each end with carved flame tips, supported on a hexagonal shaped and stepped wood base. Height 17 ½ in. The lid inlaid with abalone and ivory hearts and diamonds and stars. The length of which is covered with pin scrimshaw work of animals, houses, plants, ships, sperm whale, anchor, and heart; 28 expressions in all. Length 35 ¾ in. Forty-eight matched cut, pierced, and shaped bone ribs, crossed and flaring up from a star inlaid circular wood base, banded by whalebone rings and two whalebone bands. Height 5 ½ in. Diameter 10 in. Pine oval bottom with a conforming interlocking circles basket carved from a single piece of pan-bone and a swing handle attached with rivets. Height 3 in. Width 4 in. Length 7 ¼ in. Silver stud inlay and red wax scribe lines, once belonged to or was carved by Reuben Chase, Nantucket, Master Mariner, October 16, 1838. Accompanied by original bill of sale. Height 5 ½ in. 28 inlays of whale ivory, 343 inlays of light and dark hardwoods; the front and rear have inlaid ivory knives and forks with ebony handles; the center has hearts and initials “E.C.” in red sealing wax; the reverse has 2 whale harpoons and 2 inlaid knives. Provenance: Norman Flayderman Collection, Illustrated Pg. 208 in Scrimshaw and Scrimshanders, William Boylhart Collection. Seated couple in an estate garden with lamb in foreground, cupid with arrow looking on, family of birds with their nest. Height 7 in. Carved ivory bird grip on a bone shaft with scrimshawed lines simulating sections. L 32 ¾ in. Engraved on both sides, four full length portraits of women in elaborate formal gowns. The reverse with four full-length portraits of fancily dressed women and four children also in fancy dress on burled bases. Tusks H 19 ½ in. Carved whale ivory butterfly thumb screw clamp and finely turned standard and cup, red wax inlaid vine, 4 stars, and Mary W. Coffin, 1835. Pin cushion cup with engraved polychrome leaf vine above turned ivory sections supporting a double bone cage rising from a two-tier octagonal star inlaid cherry and ebony box with 4 small drawers and 8 turned ivory pillars on a molded base with wood feet. Height 18 ½ in. Provenance: Fred Gardner Collection. A fine large model of a 116-retractable gun ship with an elaborate carved stern and Roman soldier figurehead. The hull and mounting board are constructed with pinned planks. Provenance: collection of Sara Jo and Art Kobacker; Clive Gomshall-Lloyd Collection, Illustration #93 The Lloyd Collection of Napoleonic Prisoner of War Artifacts, Pbl 1986. Height 28 in. Length 36 in.